One of the largest home fragrance and décor companies in the United States, Chesapeake Bay Candle specializes in creating products that combine modern, organic designs with provocative and complex fragrances. Recently, LoveToKnow Candles learned how these amazing candles can be used for aromatherapy, entertaining, and home décor. The inspiration for the creation of Chesapeake Bay Candle began in 1994 when Mei Xu attended a European trade show and saw brilliant looking candles in hues like lime green, orange, and purple. She instantly realized the potential involved in bringing a fresh new product that reflected current design trends to the American home décor market. After turning their home into a candle design studio, Mei Xu and David Wang began the process of creating a company that is known for its fashion sense as well as its complex, multi-note fragrances that invite you on a sensory journey. Mei Xu, owner and president of Chesapeake Bay Candle, recently took time out of her busy schedule to answer a few questions for the readers of LoveToKnow Candles. LoveToKnow (LTK): What first attracted you to the business of candle making? Mei Xu (MX): My husband David and I started our company in 1993. Both of us were looking to follow our entrepreneurial and creative spirits and had found ourselves bored with the jobs we had at the time. We had left our native China a few years earlier to pursue graduate degrees in the United States. We enjoyed the American lifestyle and decided to stay. When we started to explore business ideas, we immediately thought we could import giftable items and products for the home from our home country. Amongst the products we selected were silk flowers and candles. In the fall of 1994, we participated in our first trade show, the gift fair in Charlotte, N.C. It quickly turned out that candles outperformed all other product offerings and we decided to focus and invest in candles. Candles were a product I loved, and where I was able to apply my fashion sense and passion for design. They are very sensual and have the power to make a house a home. LTK: What is your favorite way to use candles in your home decor? Candles make a lovely addition to your home decor. MX: People love candles so much because they can be used in many different ways. Personally, I love to entertain. It makes me happy to invite my friends and business partners to our house. Imagine you arrive at my house and you see the driveway illuminated with a hundred little votive candles on both sides of the way. You feel like in a fairy tale. It makes people happy and transports them to a different world. And that is just the beginning. I always enhance the table décor with a candle center piece. I select the colors that compliment the theme of the evening. You can just create this very special ambiance and entice your guests. I also enjoy decorating with scent. One of my favorite fragrances in Bamboo Jasmine, and sometimes I enjoy lighting a few bamboo jasmine candles in a select room. Bamboo Jasmine is a very sensual scent that finely compliments my personality. It also helps me relax and unwind. LTK: What is the best way to use candles to maximize their aromatherapy benefits? MX: Aromatherapy is a healing art that can be traced back to the ancient Egyptians, Greeks, Persians, and Romans who used to burn scented flowers and herbs and enjoy aromatic bath, massage and skin care for curative and cosmetic purposes. The main ingredients of any aromatherapy product are essential oils. Essential oils can be extracted by steam distillation from aromatic plants, and cover a wide range of natural healing, relaxing, and uplifting attributes. For an example, basil is uplifting and stimulating, grapefruit is rejuvenating, lavender is calming, and sandalwood is known for its soothing effects. The strong scent of Chesapeake Bay Candles makes them great for aromatherapy. 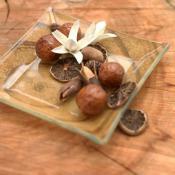 Aromatherapy candles and other aromatherapy home fragrance products contain essential oils. To maximize the benefits of an aromatherapy candle ask yourself what effects you are looking for. If you are looking to relax, you may want to take a hot bath and surround yourself with a number of lavender candles. If you are looking to lift your spirits, you can burn a few grapefruit-scented candles in the environment of your choice. LTK: What factors should you consider when purchasing candles as a gift for a friend or family member? MX: Candles and home fragrances make perfect gifts; they are very personal and sensual items. The secret to the art of gift-giving is to find something that truly compliments the recipient's personality and taste. When you select a special candle for your friend of family member start to think about who they are and what their special likes are. If you are selecting a candle for a particular spot in your friend's home you should select a color and shape that best suits the overall décor. Today candles are literally available in all colors and hues, shapes and forms. Or maybe your friend enjoys a particular scent? Maybe you feel your family member or friend has been stressed lately - why not select an aromatherapy candle that can help to relax or soothe? LTK: What are some of the signs that indicate a candle is made from high quality materials? For scented candles, the fragrance should be strong but not overwhelming before and during the candle burn. The fragrance should also fit the color story and the particular trend or theme of the candle. Wax burn is another good indicator whether a candle is made from high quality materials. The wax should burn evenly and should be completely consumed as the candle burns. It should remain smooth and consistent as it burns. With regards to wick, the height of the flame should not get too large. The wick should not let any carbon collect on its end. When the flame is extinguished, it quickly go out and not smoke excessively. Even if you're on a tight budget, Chesapeake Bay Candles are affordable luxuries. Visit your local Kohl's or Target store for a large selection of Chesapeake Bay Candle items, including gift sets, oil burners, and stylish candle holders.